Author Cliff Ball has had a passion for writing since he was ten years old. His works fall under the category of speculative fiction. All of Cliff's books have a theme that will will keep you on the edge of your seat. In the last ten years Cliff has penned such thrillers as: Out of Time in 2008, Don't Mess With Earth in 2009, The Usurper, published 2010, Shattered Earth, published in 2010, New Frontier, published in December 2011, Dust Storm, published in Demcember 2011, and Voyager and the Aliens, published in 2011. 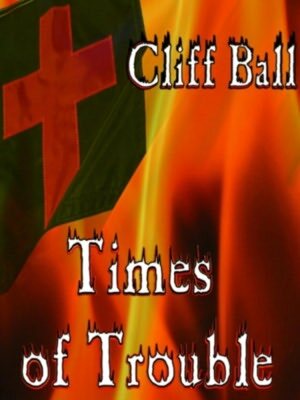 His most recent work is Times of Trouble: an End Times novel, published February of 2012. Brian, the main character, tells his story from first person point of view. His work with the FBI involves mostly cyber terrorism and actual cases of potential real world terrorism. Eventually, his wife gives birth to their third child, who has Down's Syndrome, which does not please the U.S. Health Administration because there are rules and regulations set-up in cases like these to prevent "genetic freaks" as they like to call them, from sucking up a lot of Health Admin money. Because the Atwoods are born again Christians, they never considered aborting the baby, so now the Health people have to take him away to deal with the problem later. Meanwhile, the Secret Service decides to recruit Brian to be the personal agent of the President of the United States, David Collins, due to his great work involving a case that dealt with terrorism that would've involved Offutt Air Force Base. Brian's faith is tested every day as he deals with a man who has no morals from what Brian can see, and is tested even more when his wife finds out that she's dying from a fast growing form of breast cancer. Trouble in the rest of the world occurs as Iran attempts to nuke Israel, which fails spectacularly, so Israel takes care of the problem. This brings condemnation from everyone, including the U.S., which takes the side of Iran. When the re-election of Collins doesn't turn out the way he wanted it, he and his people declare the election nullified because of supposed "irregularities" with the ballots. Collins claims that the new President-elect may take the seat sometime in the middle of next year, if everything looks to be sorted out. Collins purges his staff of what he considers unloyal people, including Brian. At the same time, he loses his wife, but regains the son he thought he had lost. Author Cliff Ball currently lives in Lewisville, TX. As a Christian Author Cliff's worldviews tends to inhabit his novels with a Christian and/or Conservative theme. Cliff has a BA in English from Midwestern State University in Wichita Falls, and is currently thinking of pursuing an MA in Technical Communications, but is currently in the process of getting a Technical Writing certificate from the University of North Texas. To find our more about Author Cliff Ball and his books visit his website at Author Cliff Ball. You can also find Cliff on Twitter, Facebook at Barnes and Noble and Amazon.